Thierry Henry, training with his former club Arsenal, would fit right back into the team according to German defender Per Mertesacker who says the club should also consider signing compatriot Lukas Podolski. 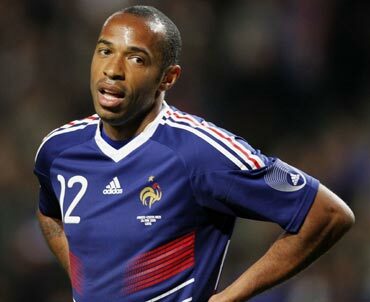 There were widespread reports in the British media on Thursday that Arsenal manager Arsene Wenger has decided to re-sign Henry, the club's record goalscorer and former skipper, on a two-month loan deal from New York Red Bulls when the transfer window opens on Sunday. 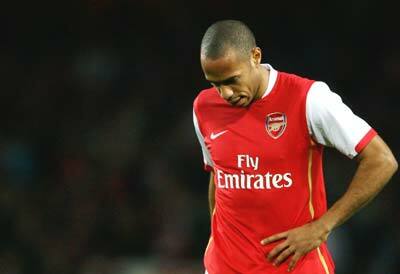 Henry, 34, played for Arsenal from 1999 until 2007 and made a total of 369 appearances scoring 226 goals. He then spent three seasons at Barcelona before joining New York Red Bulls last year. France's all-time record scorer is eligible to play for Arsenal on loan until the new Major League Soccer season kicks off in March and was at the Emirates Stadium on Tuesday to see their 1-1 draw with Wolverhampton Wanderers. Mertesacker, who has been impressed with Henry in training over the last two weeks, told reporters: "Henry has a lot of experience and he is a great opportunity for us, but I am not the manager and I do not know what is possible, for him or for us. "He has been playing very, very well in training. He still has the same attitude he has when he played for Arsenal. He has shown his class and it has been good to have him with us." Arsenal have recovered well after a poor start to the season and are currently fifth in the Premier League after just one defeat in their last 11 matches. However, they have been heavily reliant on Robin van Persie for goals this season and Henry and Podolski would, in theory at least, add some firepower to their attack. Henry scored 15 goals in 29 appearances for the Red Bulls last season while Podolski, 26, has struck 14 league goals for Cologne so far this season. As well as supporting a move for Henry, Mertesacker said he would like to see fellow Germany international Podolski in London. "He is a powerful, great player, especially for the national team. He has scored a lot of goals, is a good striker with a very good finish. His left foot is unbelievable and I am a fan of his. "The Premier League is a little different to the Bundesliga but you get used to everything." Lee-Hesh part ways again, but is it all over?